The new artificial surface for Hardin Valley Academy football/soccer field was roughly half-laid by the end of last week. It is being installed by Baseline Construction and funded through a gift to all high schools in Knox County Schools system by prominent business mogul “Big Jim” Haslam and his family. HARDIN VALLEY --- When Hardin Valley Academy opens its 2018 football season at home against Oak Ridge Thursday, Aug. 16, it will do so on a new artificial turf field. HVA received its new turf field as part of the Field of Dreams grant given by Pilot Flying J and the Haslam Family, which began three years ago. Hardin Valley joins South-Doyle, Austin-East and West high schools as the final four Knox County Schools having turf installed on their respective campus fields following the 2017 football season. In addition to being home to the football team and both the Hawks and Lady Hawks soccer teams, physical education classes will be held at the athletic complex. The new turf field was installed by Baseline Construction. Though Hardin Valley was on the back-end of KCS schools to have its artificial turf field installed, Ashe saw the benefits of the project early. 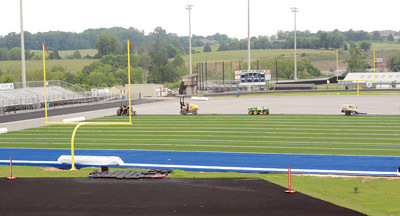 He toured the field at neighboring Farragut High School, which was among the “first round” of KCS schools to have turf installed (to start the 2016 season). “I walked through at Farragut with (FHS athletic director Donald) Dodgen when they were installing their turf there, and I was excited,” Ashe said. “We didn’t care when we got our field, we’re just glad to have it,” he added. “We’re grateful to Baseline, the Haslam family and (WVLT-TV Channel 8 personality) Mark Packer,” who wrote the grant proposal and emceed the lottery program to determine the order in which the schools would receive their turf fields. Other schools to receive artificial turf fields prior to the 2016-17 school year were Bearden, Powell, Fulton and Central high schools. Prior to the 2017-18 school year, artificial turf fields were installed at Halls, Gibbs, Karns and Carter high schools. Last fall, HVA had a first-round District 4-AAA girls soccer tourney match against Lenoir City moved to Johnny Long Complex due to rain. The $10 million “Field of Dreams” grant benefitted more than just athletics in the KCS system. The grant stipulated that $1.3 million went to benefit education in the schools and another $100,000 went to improve classrooms across Knox County.